Join us to work on your quilt projects with Cath Hall (aka Wombatquilts.) Use our classroom sewing machines, tools, and tables and work independently on whatever project you like! Cath will be there to help answer questions and trouble-shoot with you. Stuck on a technique or need help with your binding? This is the perfect morning activity for you! 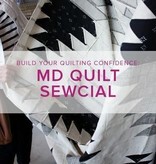 Sewcial is for ages 18 and up only. Thanks!